Have you ever sat in the waiting room of a doctor's office and wondered why they have the WORST magazines? Sorry, but National Geographic, Parents Magazine and Field & Stream just don't do it for me, but they must have some fans, because they are stocked in every office I wait in. I guess I expect them to have cooking magazines and maybe a Vanity Fair, so I can read some good gossipy articles while waiting to have my teeth cleaned. Nuh uh. (I guess I do see PEOPLE & an occasional dog eared TIME magazine). Ok, what is she getting at here? I found this pasta salad recipe a zillion years ago while waiting in a doctor's office. I have no idea if it is from Good Housekeeping or Better Homes and Gardens or Field & Stream. I ripped it out very quietly and stuck it in my purse! Though I did feel guilty about it afterwards. 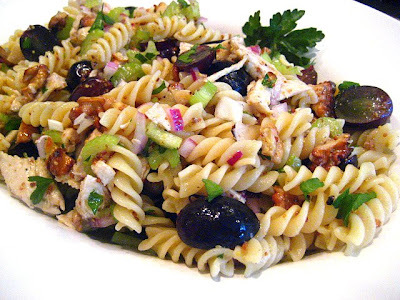 This is a really delicious, light pasta salad that I make in the warmer weather. The citrus dressing goes so well with the grapes and toasted walnuts. Cook your pasta as per directions and rinse under cold water in colander to remove starch. Toss with the rest of the ingredients in a large bowl. Make your dressing, but taste it and adjust it to your liking. I tend to like it tangy. The original recipe calls for 2 tsp of sugar, but I omit it from the recipe. Use your own taste buds! 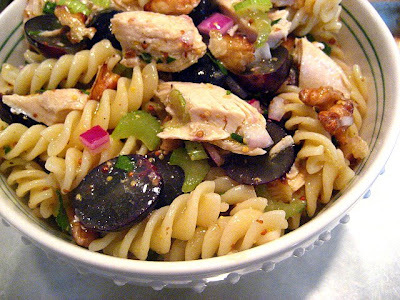 Pour dressing over pasta, chicken and grape mixture and mix. Garnish with parsley and chives. Your comment about contraband recipes hits home. I do that all the time, and the recipe I posted today was snitched by my hubby from a magazine at the gym. 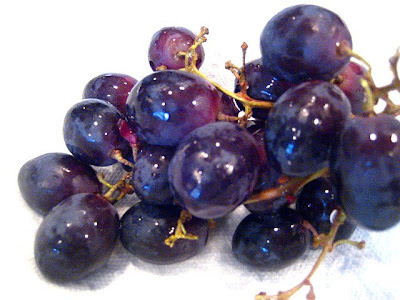 Those grapes look ready to grab and eat right off the computer. Sometimes you find the best recipes in the strangest places. Its a really pretty looking salad. Thanks for this post. First it does make me feel better that I'm not the only one that does this (if only every once in a while) and Second for sharing this recipe that really does look great. Could become a summer favorite here. At least I can "steal" this from you. This looks tasty and refreshing-- perfect for the high temps expected to hit my area of California, this weekend. Thanks! This pasta looks lovely, I've had pizza with chicken a grapes, so I know those two work well toegther. 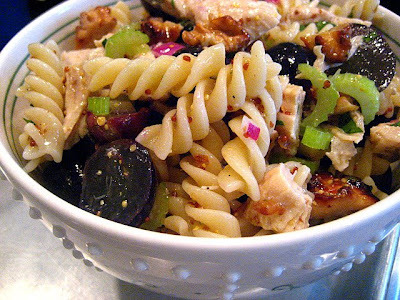 Great summer pasta salad. Funny I am just back from the dentist and my dentist is the coolest and has the best magazines. People, Food and Wine and BHG. Looks like a great summer salad~ Yum! I agree about the magazine selections in doctors offices. I don't want Field and Stream when I could really go for People or Us....some good gossip. The chicken salad looks very, very good....I'm printing it out for summer!! Oh wow, that is hilarious. You know it's funny about the mags, in my husbands office they just send these same magazines to doctors. I don't know why, they just keep coming! The salad looks awesome though. I love grapes in salads like this... they add a tang and crunch that's delish! Last year I looked at a magazine in the ER that was from 1994 - can you believe it was still there? This looks fantastic - I love the addition of grapes. Yum. LOL at the name - looks delicious! 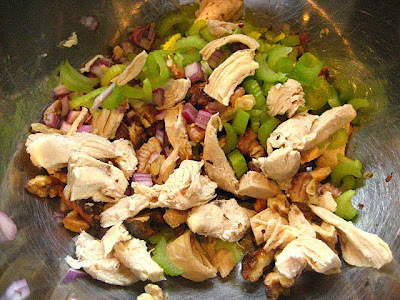 You know, those ingredients are exactly what I use in my favorite chicken salad recipe: grapes, celery, walnuts, and red onions. I never thought of putting them into pasta salad. I've been on a big kick to replace pasta in salads with quinoa and I may have to try that with this recipe. I'm glad we all will get to benefit from your contraband. I just came across your blog--your pasta salad looks delicious! Great photos too! Grapes and pasta, that's a new combo for me. It's kinda like chicken salad ingredients, but without all the mayo. This looks like a wonderful summer salad. The grapes are a nice addition. Never thought of adding them to a pasta dish. Thank you for the recipe! I love that you took the recipe! This looks really delicious, love all the flavors and I bet it's got a nice variety of textures too. The grapes sound like a nice addition. I never would have thought of that idea on my own. Aha! So you're the one that took that recipe! Seriously though, next time, try asking one of the office workers if they would mind making a copy for you. That's what they suggested at my dentist's office. Of course, you can't ask them to copy the whole thing, so be judicious. I also make notes of recipes that I want to try and then check out the magazine's website to see if it's online. Such a tasty looking pasta salad! Great recipe and photos :) I am loving your site! I've knicked some food magazines or recipes from the Doc's office...mea culpa. Good salad for picnic season...I'll bring the Plonk. So funny!! Not that long ago I waited 3 hours at my doctor's just to get a refill on an RX. By that point, I had read everything I brought with me and I saw she had a Southern Living. There were too many recipes that looked great and not enough time to copy. The issue was a couple months old and couldn't be bought on the newstand. What's a recipe addict to do? I had to have it!! I took it home with me and gained a couple new recipes I love.